The recipe is simple and easy, using ingredients you probably already have on hand. If you’re pressed for time, use store-bought pie dough or puff pastry or spend an extra 10 minutes to make the tart dough from scratch. I had an abundance of sweet, homegrown tomatoes – cherry tomatoes from my garden and yellow pear tomatoes from my sister-in-law’s, so I used them but any tomato variety will do. I left the tomatoes whole in this case – I really like the way they look whole – but sliced tomatoes work just as well. Use good quality stone ground or Dijon mustard and your favorite herbs and cheese. For this recipe, I used fresh thyme from my herb garden, both in the dough and on top of the tomatoes, but chives or tarragon would be lovely as well. The same goes for the cheese. I almost always have goat cheese on hand, but Swiss, Gruyere, Ricotta, or Fontina would also be delicious. 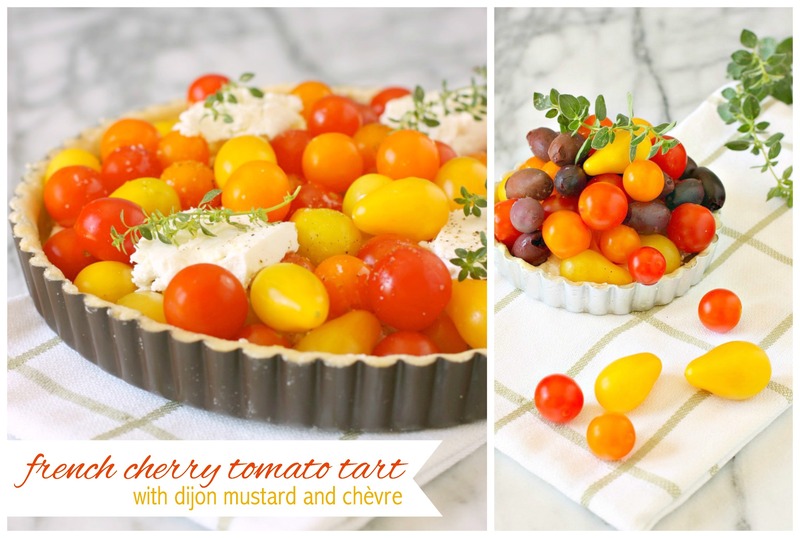 Serve this cherry tomato tart as an appetizer, side dish, or a light summer meal. Bake the tart for 30 to 40 minutes, until the dough is cooked and the cheese is nicely browned. *Note: I usually add chopped herbs after about 20 minutes of baking time so that they don’t burn. For this recipe, I added some additional chopped thyme to the dough for extra flavor. Mix the flour, salt, pepper, and chopped thyme in a medium-sized bowl. Add the butter and using your hands, pastry blender, or two forks, cut the butter into the flour/thyme mixture until it resembles a crumbly, cornmeal-like consistency. Mix the egg with 2 tablespoons of the water. Make a well in the center of the flour mixture and add the beaten egg, stirring gently until the dough holds together. Add the additional tablespoon of ice water, if needed. Gather the dough into a ball and roll the dough on a lightly floured surface, adding only the minimum amount of flour to keep the dough from sticking to the counter. Roll the dough around the rolling pin and then unroll it over the tart pan with a removable bottom. “Dock” the dough by pressing the tart dough firmly with your fingertips to make a few indentations. Be careful not to press too hard to tear the dough. Looks beautiful enough to eat! So pretty and light looking. I do a tomato tart tatin (naughty) and a nut-crust one (nice), but this is a nice happy medium. A Goldilocks tart 🙂 Lovely. I will certainly be making this recipe over the weekend (with some added roasted peppers)! Thank you for sharing. That is gorgeous and so simple – perfect for showing off those wonderful colours and flavours. This is so incredibly colourful! I love it! I love cherry tomatoes. Can’t wait to try it. Can’t wait to try this out! Thanks for the recipe! 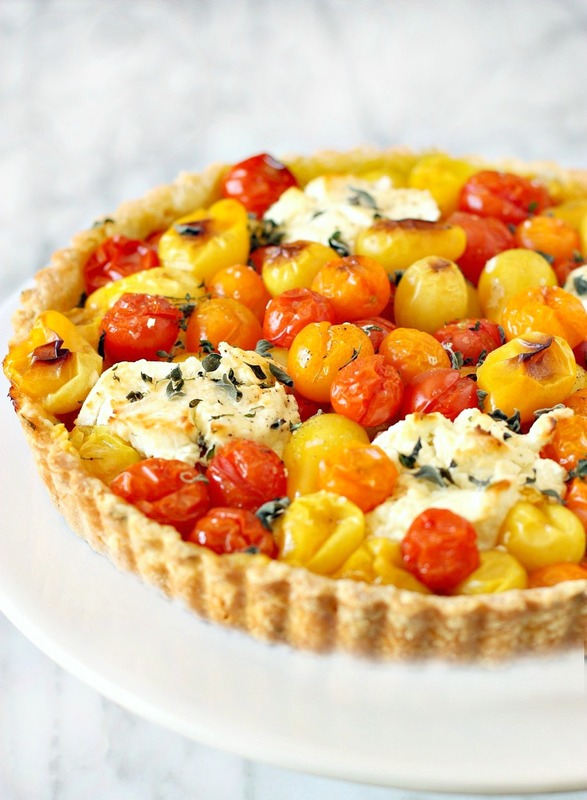 I love cherry tomatoes, I’ll be making this soon. Oh wow, what a beautiful tart! I’ve made similar things, and they’re always so glorious and summery. Tomatoes + pastry + cheese = perfect. This looks absolutely beautiful! Sadly I can’t garden for my life but I’ll see if they have cherry tomatoes at the farmer’s market. What kind of varieties did you use?